Busy days for me buzzing along the coast. Thank goodness for my Coys Rent-A-Car! 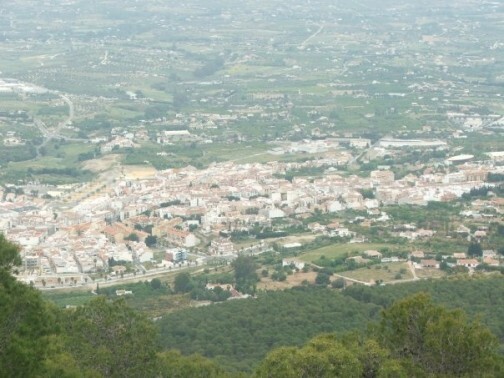 Today I am back to the west of Málaga to the charming town of Alhaurín El Grande. It’s just 10kms from Karen’s Coín – a pleasant two hours’ walk in the countryside or less than 10 minutes in the car. My host today is Sandie Ashing whose name is well-known in the area because of her work with The Family of Sound and her commitment to local charities. She’s also “famous” because her husband is no other than …… Stuart Ashing. Alhaurín el Grande itself is a beautiful old town, a mix of the old traditional white sugar cube houses and a bustling town centre, branching out to more modern style apartment complexes on the edge of town. Then it is countryside houses, & mountain forests. It is only 45 mins drive from the coast, only 30mins from Málaga airport, Alhaurin el Grande (“the big garden”) is set in a basin, surrounded on 2 sides by mountains. It’s an oasis of fruit trees. All around the outskirts of town you will find smallholdings of fruit farms. The area is surprisingly lush green, and even the smallest garden can happily growevery thing from grapes to grapefruit, olives to nuts. Nestled in the hillside between the two towns of Alhaurin el Grande and Alhaurin de La Torre, you’ll find the hills really are alive with the sound of music. This is the home of The Family of Sound, a talented group of children and teens who come together to learn drama & song, as well as gaining confidence & meeting new friends along the way. 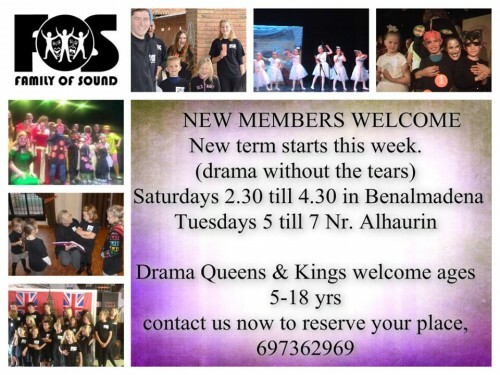 (Drama without the tears,as we like to say) The group perform everything from singing and talent displays & “along with the adult members” larger musicals up to full blown pantomimes. One of their many unique features is that whilst having fun and entertaining audiences they are also raising money for local charities and worthy causes along the way. New members from age 5-18 yrs are welcome to join on Tuesdays 5pm till 7pm. 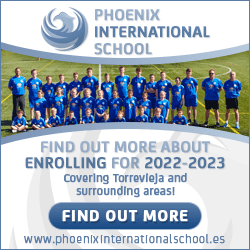 We also have a class on the coast in Benalmádena on Saturday afternoons 2.30pm till 4.30pm, again from age 5-18yrs. Another famous face to watch out for around Alhaurín el Grande, is world-renowned hypnotist Stuart Ashing. He is , in fact, one of only four hypnotists in the world who perform their shows in both English & Spanish! Hypnotising in two languages is a very rare skill indeed. Stuart has been performing his English show worldwide for over 25 years including here on the Costa for the last 10 years. During the last 5 years he has been honing his skills to perfect a dual-language show, known as El Hipnotizador. So far only Holiday Village hotel guests and private party bookers in the area have seen this extra special show. Stuart is about to launch his Spanish theatre tour over this next 12 months so I think we will be hearing a lot more about him. These theatre shows will also be raising funds for his chosen charity, Cudeca, the only hospice in Southern Spain and will boost their much needed funds, as 30% of tickets will go to them.Tickets for these special nights will be in high demand, so make sure you book early to avoid disappointment. Regular appearances this year and last on MTV have seen Stuart’s street credibilty increase 10 fold with an influx of people wanting to be hypnotised by him both on and off stage, including some well known but un-named celebrities. Stuart is very discreet and professional that way! Yes, you name it, and he’s fixed it! For more pictures of the Alhaurín area please see our gallery.